UConn coach Geno Auriemma couldn’t stop grinning. The player who led his Huskies to four consecutive NCAA titles had just won her first WNBA championship at the age of 24. 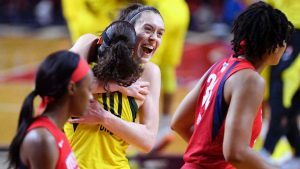 Auriemma said it all happened exactly as he expected for Stewart, the Seattle Storm forward who had a 30-point, eight-rebound performance in a 98-82 Game 3 victory over Washington to complete a championship series sweep Wednesday. “Stewie is not the kind who breaks the door down, and comes in and goes, ‘Watch me!’ ” Auriemma said as he stood outside the cramped but joyous Storm locker room at EagleBank Arena. “She’s never been like that. So I wasn’t surprised it took her a couple of years to get the lay of the land, see how everything worked, see what the pro game was all about. Stewart struggled a bit her first year at UConn but had things under control by the NCAA tournament. She was the most outstanding player of that event all four years at UConn before being drafted No. 1 by the Storm in 2016. She was WNBA rookie of the year, but the team results then and in 2017 were not up to her standards. Wednesday, she was 4-of-5 from 3-point range, part of the Storm’s 13-for-26 performance from beyond the arc, and that made her even more effective.